Adding Shiitake mushroom stems to Kinpira is a great idea since the stems have light crunchy texture. They can add Umami to the dish!!! FYI: Kinpira is a simple Japanese sautéed or braised vegetable side dish. It is served warm or at room temperature. It goes great with white rice and perfect for Bento lunch box!!! 1. Cut off the hard part of Shiitake stems and shred with your hands. 2. Thinly slice carrot and green pepper. 3. 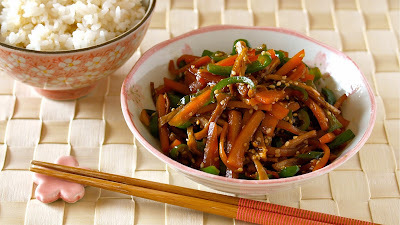 Heat cooking oil in a frying pan, add the Shiitake stems, carrot and green pepper, and cook until coated with oil. 4. Season with salt, sugar, and soy sauce. Then cook until tender. 5. Mix in sesame oil and white sesame seeds to finish.